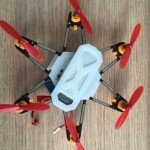 A new 3D-printed drone called the ELF VR Nano is available for pre-order on Indiegogo and for download on Thingiverse. That’s right: you can either buy the product and receive pre-printed parts or you can simply print it yourself. It’s one of the purest open source hardware plays I’ve seen in a long while and it just goes to show how cool it is to be able to print your own plastic parts at home. ELF began as a design project last October and the quadcopter is now complete. You can pick up a kit now for $65 on Indiegogo or simply print out the parts yourself for free. DIYers will also have to buy the motors and electronics but with the ubiquity of DIY manufacturing tools that’s far easier than it sounds these days. The drone is quite small but it can take and transmit video. The team hopes that users will stream the 720p video camera output to a VR device like Google Cardboard and the whole package snaps together without screws or glue. The company plans to ship in July and it looks like they’ve completely beat their goal funding goal.